Öğüt, born in 1981 in Diyarbakır, is a sociocultural initiator, artist, and lecturer who lives and works in Berlin and Amsterdam. He is the initiator of The Silent University, which is an autonomous knowledge exchange platform by refugees, asylum seekers. 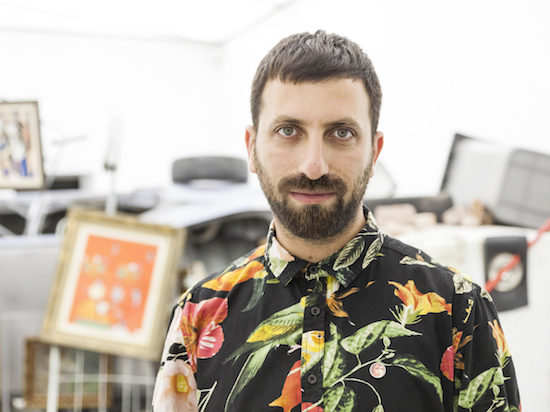 Working across a variety of media, Öğüt’s institutional solo exhibitions include Round-the-clock, Alt Art Space Istanbul (2016); Forward!, Van Abbemuseum, Eindhoven (2015); Happy Together: Collaborators Collaborating, Chisenhale Gallery, London (2015); The MATRIX Program at the UC Berkeley Art Museum (2010); and Kunsthalle Basel (2008). He has also participated in numerous group exhibitions, including the British Art Show 8 (2015-2017); Okayama Art Summit; 11th Gwangju Biennale; Museum On/OFF, Centre Pompidou, Paris, FR (2016), the 13th Biennale de Lyon (2015); 8th Shenzhen Sculpture Biennale (2014); Performa 13, the Fifth Biennial of Visual Art Performance, New York (2013); the 7th Liverpool Biennial (2012); the 12th Istanbul Biennial (2011); the New Museum Triennial, New York (2009); and the 5th Berlin Biennial for Contemporary Art (2008). He has taught at the Dutch Art Institute, Netherlands (2012); the Finnish Academy of Fine Arts, Finland (2011–ongoing); and Yildiz Teknik University, Turkey (2004–2006), among others. Öğüt was awarded the Visible Award for the Silent University (2013); the special prize of the Future Generation Art Prize, Pinchuk Art Centre, Ukraine (2012); the De Volkskrant Beeldende Kunst Prijs 2011, Netherlands; and the Kunstpreis Europas Zukunft, Museum of Contemporary Art, Germany (2010). He co-represented Turkey at the 53rd Venice Biennale (2009).